This review article embarks on a journey through Einat Amir’s performance and video installation piece, Our Best Intentions, that was shown at the 13th Performa Biennial in New York in November 2013: in what follows, I narrate my experience of this journey as a spectator and participating performer – a narration attempting to reflect on the intricacies embedded in these overlapping positions. Amir, who has showcased her work at Performa before (Ideal Viewer, Phase One, Phase Two, 2009), and whose work features in solo and group shows throughout Europe and the US, herself embarked on a journey leading in new directions with this piece. Begining as a video artist who featured in her crafted, queer-themed and queer-looking scenes (for example, Boi, 2004, and Becoming, 2008) Amir has gradually been moving towards breaking the apparent boundaries between the space of the screen and that of the audience. She has been inviting artists, actors, and finally, spectators, to collaborate with her, participate and interfere in her work thorough aesthetic and political investigations of authorship and spectatorship. Enough about You from 2011, which is still touring around the world, is an example of Amir’s recent artistic direction: in this work, ten people at a time were paired and asked to enter five narrow glassed boxes, stand next to each other and follow the guide’s requests to dance, converse lightly, shake hands, kiss and other intimate gestures, together, and in front of several spectators who were chosen to view the boxes from outside. What paths are Our Best Intentions paving in the contemporary exploration of spectatorship, authorship and live performance, real-time intimacy, interactivity, agency, affect and re-enactment? Let me offer my narrated experience as an insight. ‘I feel really embarrassed, but I’m so overwhelmed… so maybe what I can ask for is your non-judgment, and to be on my side,’ pledges Lior, the woman appearing in the ten-minute video work, who is, noticeably, wearing a black vest with a white print of the word ‘Pain’ on it. Shlomit responds to her reassuringly. Taking place in what seems like both a dining hall and a showroom, the women’s rapport, part of a group therapy session that is also a participatory performance, unfolds before us as we watch the video: the scenery and screen harbour not only Lior’s and Shlomit’s emotional exchange, but also the other subsequent role-plays that arise from the session. By absorbing these occurrences, our eyes are unable to avoid the three other videos on display in this 4-channel video installation. Spectatorship cannot be experienced as a full and stable continuity in the viewing space. Dedicated attentiveness is nevertheless cultivated and re-enacted in the space. The other three videos show three groups of people sitting together, looking and listening, very still, as the intimate interaction becomes more dense and complex. Lior first takes on the persona her estranged father, Ron, who she has been denouncing for the past eleven years. Then, she ventures to play herself too, asking another member of the group to play her father, in order to verbalise the thoughts that she would have liked to have told the man that she had removed from her life so long ago. Co-ordinating the session, Shlomit oscillates between directing the members about what to say and letting them improvise their performances through the gaps that occur between her instructions. When Shlomit directs Lior to change position, the camera closes in on Lior’s facial expression, focusing on her teary eyes, and capturing and framing them as a representative sentimental element. The lens renders this audiovisual moment as characteristic of Lior’s dispersed and fluid – indeed, watery – affective state. Lior dries her tears and returns to her seat next to the other participants, as they all sit down to listen to the next session beginning to play on the next screen. The session guide, not a therapist this time, but a choreographer, leads the group to new verbal and physical exchanges in a space set-dressed as a living room. In the third video, another man portrays a woman’s father, yet far from conversing, they unrestrainedly yell at each other, as the session guide – a theatre instructor – encourages them to pursue this exchange. In the fourth, another woman unleashes her tears, lying down on a carpet with a man that acts as her arrogant husband. The close-ups of the womens’ diluted vision and tear-filled eyes are familiar: as they cite and resonate with scenes from reality TV shows, where we may regularly witness what Anna McCarthy has called ‘televised displays of personal pain’1, as they celebrate an entire ‘neoliberal theatre of suffering’. McCarthy’s milestone study of the ‘affective modes of selfhood’ that shape the scenes of ‘painful civic pedagogy, suffused with tears, rage and insults, and pushing the limits of the self to mental and physical extreme’ stresses and demonstrates the importance of critical accounts of popular contemporary audio-visualised agonies. For McCarthy, these accounts enable a consideration of ‘the genre as a realm of excess’, elucidating ‘the processes of self-organisation in which modern subjects find themselves caught’.2 The endeavour at the heart of Our Best Intentions is to use this reflexive imagery, that is both reminiscent of reality shows, and analytically similar to McCarthy’s scrutiny. Once the video installation is shut down and the lights go out, we become part of an experimental examination quite similar to the one Lior experienced and expressed, yet also, quite different from it. The four-channel video installation is only one component of the multidimensional Our Best Intentions. The second component is a series of live participatory performances that invite the spectators to partake in sessions similar to the video that Lior featured in. The video installation was deliberately displayed in the same space as the participatory performances, thus enhancing a sense of expectation for the spectators. The main scene from the video stimulated my anticipation for the upcoming experience that the show was about to provide: I, like Lior, could use a good cathartic cry, I thought. And yet, being far removed from the well-prepared and rehearsed Lior and Shlomit, who knowingly acted and were trained for the video, I did not quite know what I was getting myself into, even after watching them. Our Best Intentions is reminiscent of other contemporary artworks. The installation of screens in dialogue, from which individuals share and listen to each other’s storytelling, brings to mind the work of Omer Fast. 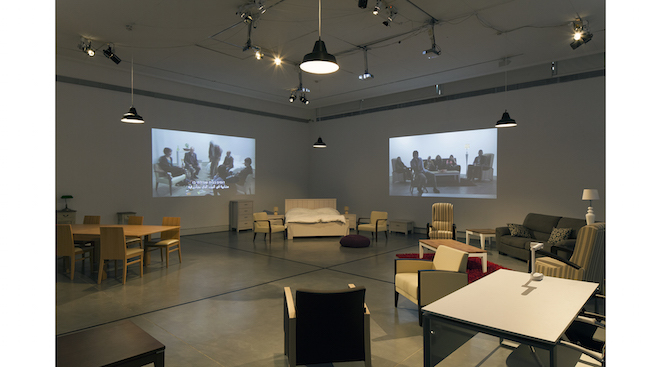 Fast’s works, such as The Casting (2007) and Talk Show (2009), investigate interchangeable modes of witnessing and confessing. Amir’s usages of printed and spoken words – such as the slogan t-shirt ‘Pain’ that Lior wears – interrogates the processes of meaning and making, engendering the retelling and re-performing of personal histories. This technique notably evokes Sharon Hayes’ work on protesting. However, because I am taking part in the performances, it is difficult to objectively investigate such references to the work. This is not due to a lack of any historical or contemporary references to performance art of this kind. Indeed, Amir’s work closely corresponds with Tino Sehgal’s ‘Constructed Situations’3, for example, as both rely on the voluntary collaboration of the audience. Rather, it is because of what happens to, and lives on with, the participant in the performances that Amir and Sehgal assemble. The very participation in the performances hinders the spectator-now-actor from preserving their experiences in neat drawers of descriptive referential memory. The participatory performances within Our Best Intentions differ from Amir’s previous ones, and from Sehgal’s, in that they nurture the intensity of the spectators’ participation in the performance, and centre them as the visible focus of the show. Over the years, Amir’s video and performance installations have encouraged varying degrees of audience participation, ranging from active assistance in the theatrical production,4 to intimate interactions between spectators who were previously complete strangers.5 Amir has not previously so overtly demanded an audience to generate not only acts and movements, but also elaborate thoughts and feelings, and to participate in the performance with a physical and verbal presence. Even when I was finally spared a moment to watch the others, I could barely watch because I was too preoccupied with how I was going to look, what I would say, and what everyone would consequently think of me, when I next would be speaking, or perhaps stuttering; appearing as the object of everyone’s gazes. The group guide, the session, the video installation and the performances of Our Best Intentions all seemed to be delivering the promise of making a refuge for my inarticulate need for emotional attachment. While the filmic segments of the work aspired to crystallise a lucid yet staged series of displayed disclosures, excavating the inner workings of pain for the audience to watch, the participatory performances contested the merits and privileges of spectatorship. Foregrounding moving close-ups of the climatic moments of the sessions, the videos left out the mundane, sometimes monotonous, moments that the sessions also contained, and that the participants went through, all the while hoping to fulfil the promise that Lior suggested to us: to see and be seen, to disclose and deliver, to experience stardom and indulge in sentimentality. 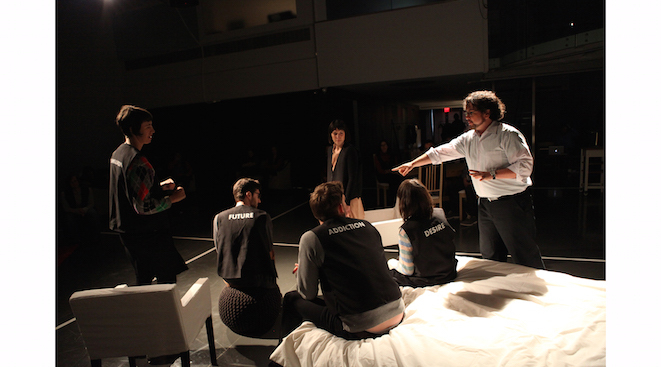 And yet, to craft something as a promise, Laurent Berlant has contended, ‘is to allow us to encounter what is incoherent or enigmatic in our attachments.’6 How did the participatory performances produce this promise? To explore this question, let me begin from the end. I have been trying to compose this review of Amir’s performance piece since the evening that I participated in it. Yet, unlike the highlighted titles on the vests, my words did not form smoothly into sentences. After many attempts I finally realised: the work had deprived me of the very capacity of witnessing it from the outside. I was unable to generate the coherent insights of an independent spectator and reliable critic. Instead of remembering an observed show occurring on the stage separate from me, I remained with the fragmented residues of being a participant and performer. The beauty of the show lies in its valorisation of agency and empowerment, inclusive accommodation, and also an exposure to vulnerability. Emerging from the ‘best intentions’, it invites the spectator to step in. However, after making room for them and rendering them as a participant, the show also hinders one from the pleasurable and protected experience of objective viewing. Furthermore, by wishing to empower the spectator, the show in fact imposes its own restrictive power, in this way both endowing one with agency as well as making it difficult for them – for me ‒ to criticise the deprival of agency that was nevertheless taking place there. How should I, then, verbalise the desire to speak, act and be what I have experience? A desire that was engendered by formerly and properly planned instructions, or in other words, an instructed, instructive, and perhaps inflictive, desire to please. How may I demonstrate the mechanisms of an act of choosing that follows the practices of arranged coaching? First of all, I would like to frame the performance as an event, one whose singularity encapsulates its spatial and temporal multiple dimensions intricately weaved by wishes, prophecies, spectres and reiterations. Respectively, I will endeavour to reconstruct my experience of the performance in the past and present tense alternately, in order to not only describe it, but also relive and instantiate it as I am writing, so that the reader could sense it while they are reading. ‘I don’t feel like giving back the vest’. This thought ran through my head as the performance came to a close. Instructed to pick from the selection of uniformly designed yet differently labelled vests hanging at the entrance at the start of the performance, I put on the one bearing the word ‘Body’. Yet my body and this new ‘Body’ did not wish to break apart: it was as if the signifying garb managed to discipline my now evermore signified self. I remained in the performance space for a while longer, trying to spend more time with the people I had got to know there, until the woman that had initially instructed us to choose a vest now asked for them back, also informing us that the show was now over. Although I had only met my performing peers for the first time within the space, I had begun to feel like I had known some of them for a lot longer. When I first walked into the performance space wearing my ‘Body’ vest, I followed the instruction to sit down wherever I would like. In front of me stood four demarcated halls. Each simulated a room in a house, and/or perhaps also a showroom at a furniture store: a living room, a dining room, a bedroom and a work-space. The other participants walked in and sat down as well, wearing their vests too; including ‘mother’, ‘desire’ and ‘pain’, among others. Intentionally, I found my seat at the margins of the space, in a seemingly detached spot behind what seemed like an office desk and waited for the show to begin. People congregated in groups within the simulated rooms, and, following the instructions of their session guide, they conversed, performed, screamed and sang, to the guide, to each other, to the furniture. Well-timed, the sessions ended one after another, and the lights intermittently went on and off. The light illuminated my protected workspace and fortress last. The spotlight signalling that I had to leave my seat and start whispering, running, humming and climbing the walls, according to instructions. As bodies moved and sweated in front of the audience now sitting on the dark side of the theatre space, I acknowledged that the eyes gazing at me, know me, and have compelled me to know them before too. To that end, my wish to remain distanced from the scenes was bound to fail before the spotlight had dazzled me at my desk. For, even that niche that I recognised as the margins of the space, was an inherent part of it. Indeed, I was invited to sit comfortably wherever I wanted; and yet, since comfortably was requested, perhaps demanded, of me, it thus immediately became a decree, one confined to the context of the elusive event, and one that would unsettlingly terminate when the event ended. Yes, I took off my shoes willingly, but also, I was asked to do so, just as I was later asked to put them on when the event ended. As the event was unfolding, I refrained from resisting the instructions: for, what could be more pleasurable than doing as you are told, even if just for a little while? And yet, in return, the pleasure of submission is taken away from me. It was precisely because of my complete absorption and embodiment of the role that it ended by feeling painful as the session ceased. As the internalised instructions and rendered decrees translated to acts and movements of choice, and even fun, it was finally me who was there, instructed, spoken to, danced with, and formed verbal, vocal, and physical transmissions and/as affective re/de/attachments. And now, after giving back my vest, I found it difficult to testify on the processes of performative production, precisely because they have succeeded in instructing, casting, constructing, and finally, restricting myself as someone with agency. And now, where do I go from here? I go home, of course, for, home is where furniture similarly stands in order, and where you are invited to take your shoes off, and where you must not let your toes get too accustomed to the touch of the floor: for, what if they tell you that you have to leave? That would just be too painful. Now, I know that the sight of a designed furnished space triggered the remembrance of a very painful matter for me. A matter that, I now know, has profoundly impacted me, constantly, ever since I moved to New York. The matter of home as anything but a fact on the ground, the matter of homelessness as a habitual state, and the ways in which my desire, as well as incompetence, to create one for myself, are determined by the political conditions and circumstances recurrently displacing me in the world. As a dramatic event encompassing both temporal singularity as well as multidimensional simultaneities, Our Best Intentions expresses the disillusionments of time itself. It contests our control over our ramified present as well as underscoring the understanding that the political conditions and circumstances operative around us precede and produce our wills and wishes, while constituting, as well as often thwarting, our best intentions. Although not re-enactment, Our Best Intentions, as video installation and participatory performance, has nevertheless sharpened my awareness to the moments that return to us from that place in which our desires are woven. It reminded me that I am always repeating an action that has already been performed elsewhere. Watching the videos, and then re-enacting my own scenes within the performance, I kept thinking how strange it is that the pictures from my past are being revived right in front of my eyes. However, now, I believe the events of Our Best Intentions have simply generated an intricate repository of possible scenarios, capitalising on the probability that the participants will experience and/or embody a re-enactment, or: a memory revived in the present due to its liveable recurrence in the future. Indeed, the past returned, but at the same time, Our Best Intentions modelled and retold the story of the home that I once lived in. Shirly Bahar is a doctoral candidate at the Jewish Studies Department, New York University. Bahar is writing her dissertation on performances of pain in documentary cinema from Palestine/Israel since 2000. The author’s article Coming Out as Queen: Queer Studies, Jewish Identity, and the Book of Esther were published in the Studies in Gender and Sexuality Journal (September 2012). Einat Amir's show, Enough About You, recently premiered in the UK at TRIAD Gallery in Central London from 9-18 October 2015.